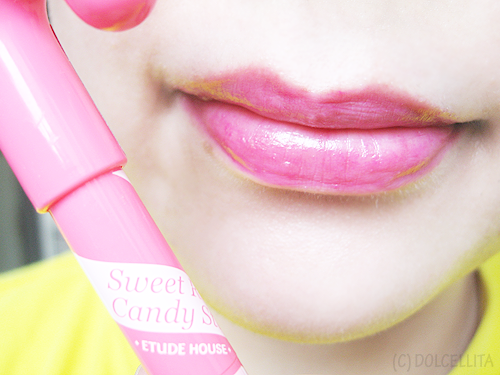 With Etude House having already released its newest makeup collection, "Dear Girls", I decided to finally put this post up featuring some of the products from their Sweet Recipe collection. These are actually birthday presents from my bff so thank you, dear! I also have one more Sweet Recipe item which I'll review in the next post. 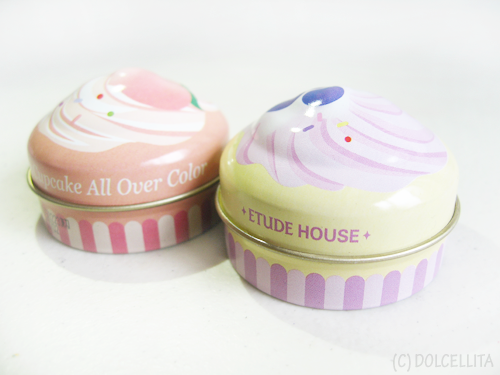 I was a bit late in seeing these items for real since the small Etude House stall in SM Makati only recently started selling from specific collections or lines. Before, I always had to go to an actual EH store in Megamall which is farther away. I still have to since the SA told me that they won't always get every item for each collection, but at least I won't need to make the trip as much anymore! 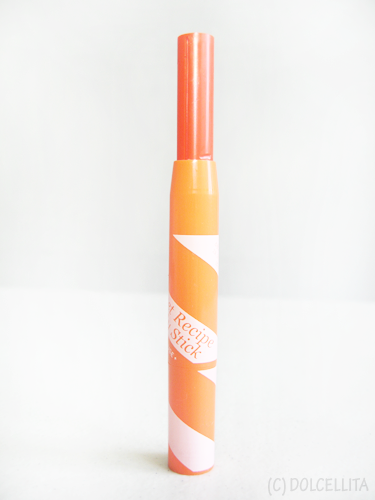 The Sweet Recipe Candy Sticks are a lip balm and lip tint in one and there are three kinds: Lemon, Berry, and Orange. I got the latter two. The product can be dispensed or retracted again by twisting the bottom. My Berry one is faulty though, as it doesn't go back in no matter how much I twist so I have to gently push the product back inside each time. I should have gone back and had it replaced, but it's too late now. Oops! 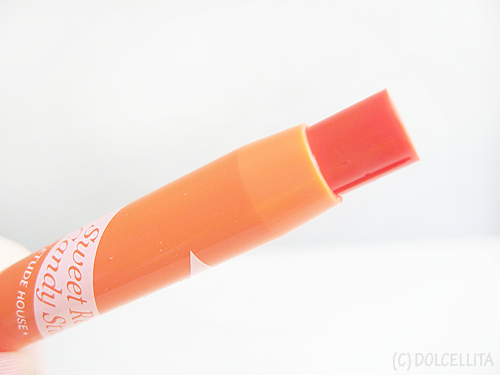 Like your typical lip balm, the texture is smooth and it glides onto the lips easily. You can also swipe on as many layers as you want to really build up the color, like I do. I did about 3-4 swipes here for the swatches. 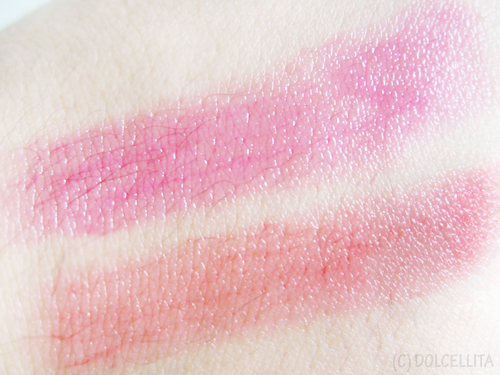 All the shades offer a pink-ish tint to the lips, they just vary with the intensity. Berry is almost like a bubblegum pink and is my personal favorite. I can't leave the house without some form of color on my lips, may it be lipstick or lip tint, so sometimes I just use this along with concealer, BB cream, and mascara and I'm all set. 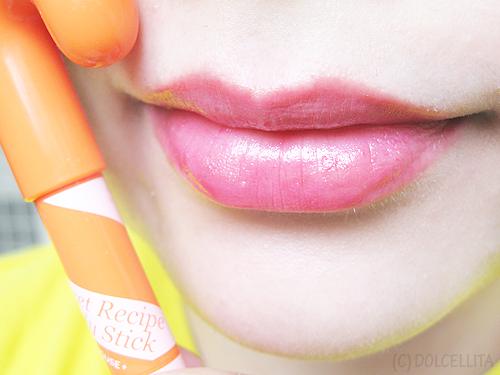 Orange comes off more natural and makes your lips look like they're naturally pink and healthy. Orange tends to look different under artificial light though, and the orange undertones in it become more prominent compared to if it's under natural light like in the pictures, hence it becomes 'darker' almost when worn indoors. 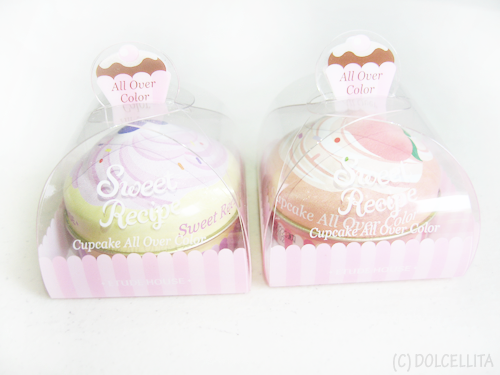 The Sweet Recipe Cupcake All Over Color come in 30g tins made to look like actual cupcakes and pretty much do what the name implies. 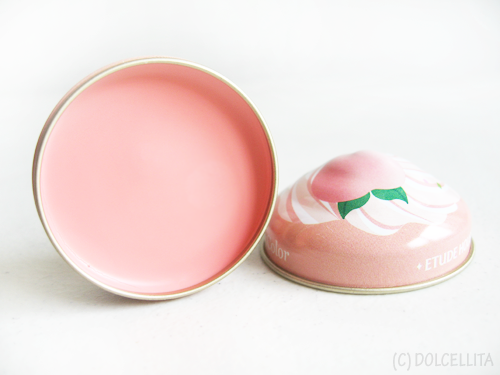 You can use it as eyeshadow, blush, or on your lips. There are 5 shades (or "flavors") to choose from. I got OR202 Peach Sugar Cake and PK001 Blueberry Cheese Cake. 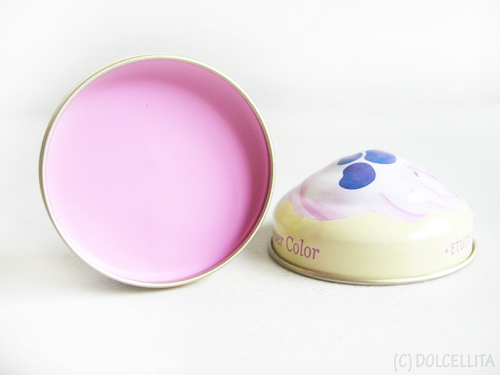 These All Over Colors are in cream form and they can be either be used on their own, or as a base for a powder blush or eyeshadow. 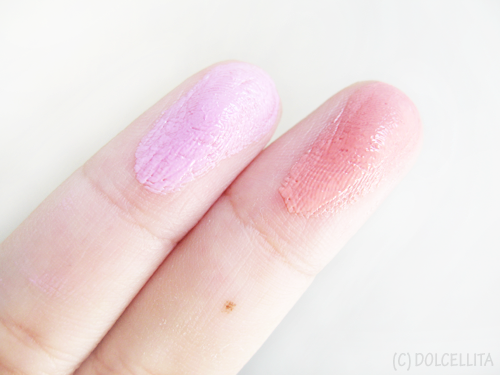 The shades for the All Over Colors appear quite light and faint when first applied, especially if you're fair-skinned, but that also makes them very buildable which is nice in my book. 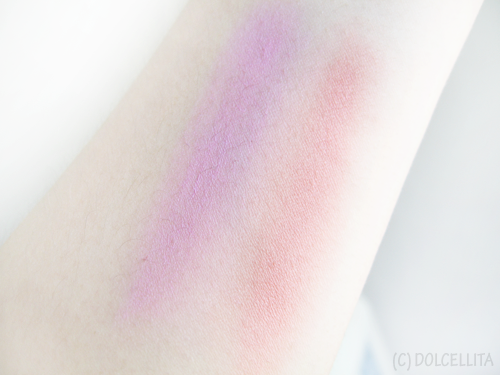 For the purpose of swatching, I applied both colors quite heavily on my arm. You can do the same for your eyes and lips, but of course for blush, less product and a lighter hand is best. Out of all the products, the Candy Sticks are definitely my favorite. I love how either sheer or pigmented they can be, depending entirely on you and how much you apply, while also making my lips look healthy and moisturized. Always a plus for someone with dry lips like me! They're great for everyday use also, and perfect for either work or school. As for the All Over Colors, I only really use them primarily as blush and sometimes eyeshadow. I don't use it for my lips because it's extremely drying on them, sadly. In the end I do really love this entire collection from EH and I wish I'm still able to grab more items from it while I can, in particular the Chocolate Eyes palette or Chocolate Highlighter. I already can't wait for the "Dear Girls" collection to be released here! The Sweet Recipe collection stuff smells good too! 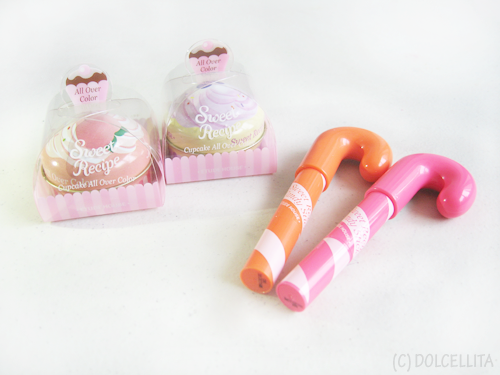 Everything smells like candy~ It makes it harder not to eat it, haha. I've checked the highlighter on this line and I find it a little bit chalky :(. Oh, really? That's a shame! Might as well try going for the chocolate palette instead then. 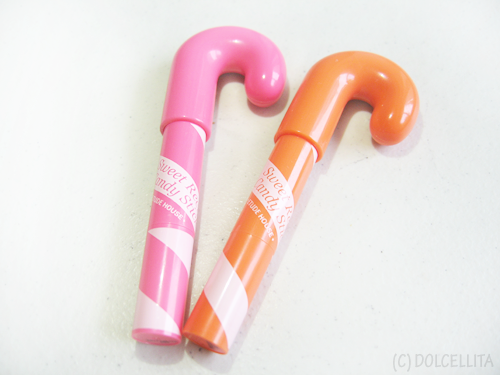 Those candy sticks are adorable! It may possibly be discontinued in EH boutiques already. Since they get the collections first, they'll be the first ones to also discontinue them too, whereas the smaller EH stalls keep them around for longer but are also the last ones to receive collection pieces.